Shopping around for fire pit accessories is hard, it’s difficult not being inspired or wondering if the little accents that catch your eye will work with the theme of the fire pit you have at home. Add to that the almost infinite variations you can find online and the design landscape can me intimidating, to say the least. Shop for fire pit accessories here! So to help you out I tried a simplified classification based on materials to find out the accessories that will work with your theme and that will give you the most freedom in your search so you can explore your inspiration in a boundless fashion. Let’s start out with the most natural of settings for a fire pit accessory and move on to more modern abstract designs as we look at more modern materials and accessories. Under each material, I will try to inspire you with a style, an atmosphere a tableau that you can draw from and express onto your own yard, garden or patio. Some solutions require large open spaces and a lot of distance from your neighbors so take only inspiration from my larger tableau and apply it in smaller scale using a safe gas fire installation with either propane or natural gas and faux assets, to achieve the same effect. In general the more natural the look, the more space you need to achieve the same effect, while more modern designs evolved in more cramped urban settings. Another important note, most gas fires are either rectangular or round, use what best fits your other assets. If in doubt go for a round fire. But a linear flame is really impressive and has more punch than even your natural log fire. Wood is the fist theme you associate with fire pits so it makes a lot of sense that most fire pit accessories will be made out of wood. It’s the material we associate most with fire, anytime you go to a cabin with friends or want to have an intimate evening and there are just too many stars outside to settle for just the regular indoor fireplace. We’re in the woods right now and infuse the scene with that log cabin feel. Polish them and add a layer of sealer and make them improvised rustic bench. A central huge log is almost a cliché at this point and still has a strong impact however you use it. Go for a more carved look if you are literally next to a log cabin, or for a more subtle and polished bench if you are in a small town in Colorado. In an urban environment continue that “log cabin” theme and make it the support and excuse for the fire. Carve out space for a heat resistant tray and some space for the gas installation trough the log, and place some lava rock or pale fire glass on top of the gas. This installation is a great way to make a smokeless “log fire”. This is also a more interesting interpretation than the usual faux “logs on gas fire” that just sit in precarious position forever. Most cabins I’ve seen actually have that gas fire with the faux logs on top and they usually look terrible. Another scenic alternative is log racks are also a good alternative, the bigger the better. Another type of wood, that is more convenient is pallet wood; it’s a cheap and easy source of good nice wood grain. Just get creative with the material and nobody will be able to guess from the results the humble origins of that the wood source. For nice finishings close it up with some sealant, and it’s gonna require a lot of talent because it’s very thirsty and for more experimental looks feel free to try some of the thousands of stains on the market. In a cabin in the woods setting, pallet wood walls, even a fake one, complements the outdoor look and brings the scene together, if your fire pit isn’t all that large. Cover an old mini fridge with slices of timber giving it the impression of a log rack and you get a covert mini fridge on hand without ruining the ambiance. Integrate variations of this as fences, separators or even under some boring benches as filler for some otherwise uninspired seating options. Set up a pathway with some ravished pallet wood, bash and crack them with some rocks and then darken them over a fire for some really dark broody colors and cracked texture that just ooze out mood and atmosphere. Put some tiki torches or oil lamps made out of forged steel and you have a Pacific islander look that can vary from vacation time in theme to really dark and moody based on the amount of life you have around. For the urban “logger” a DIY wine rack with a wood theme is a nice touch that can add another layer to the outdoor feel. Also, I’ve seen some very interesting options you just plop into the ground. If your seating arrangement is low like a lounge or more rustic like a log, your guests will be very thankful for the added accessibility feature. For a more bottled up outdoor fire pit look. Add some dark gray firestones around your deck and a long continuous fire on both sides of the deck for a very versatile campfire look. It’s like using torches, but stronger in effect and without the added holiday vibe to complicate the scene. I know it sounds kinda weird, but it’s not really, metal chimineas are a great alternative to large fire pits when you have limited space. And they ad a lot of character. For a more versatile asset, go with black steel, that can work anywhere from a Victorian garden to a Portlandian roof top. We associate dark, forged steel elements with fire at a primal level, it’s maybe even a stronger association that with wood. Forged steel patio elements are the more versatile options than the earthy texture of wood doesn’t work in your “cleaner” garden. They have a lot of character that you can shape into a wide variety of styles from colonial to the post-industrial art deco look. Just use it sparingly in busy gardens and use a bright background so that the dark curves of the forged steel can be clearly seen. One of the worst things about forged steel is that people use very nice designs and shapes as utilitarian filler. As the accents of a patio roof, table legs or potted plant supports. Please trust the element, let it stand by it’self. Don’t cover that forged gate, that lamp post, or that forged fire basket. 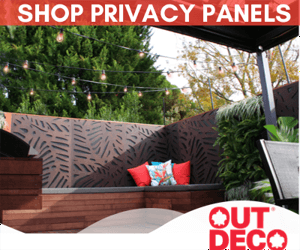 Use galvanized sheets and corrugated steel for some industrial element that just touch on modernism but keep a grimy contemporary look fit for a busier garden. Brighten the scene up with some fire glass and give it all a 70s rehaul, without stepping into the clean, abstract modern look. And finally use flat steel surfaces. Use them for fire elements, to bring the fire into the 20th century with a monolithic thin but tall chiminea. Combine this with understated warm wood surfaces and plastic and some concrete designer elements (I’ll talk about those later) and give your backyard that designer, New York loft/rooftop feel. Being modern and abstract, keep your elements bold, simple and use them sparingly, black is a color and light tones are background when going modern and minimalist. Use copper, zinc or steel sheets are as an interior reflector for deep smaller fire pits. Cover the interior rim of the fire pit in sheet metal and then enjoy the amplified shimmering. It’s like fire glass but for large deep fire pits. The crucial part of this trick is the depth of the fire pit, you should not be able to see the flame or the interior from your vantage point. Only she shimmer of the light should be visible. This also works for smaller setup and gas installations, just use round flames instead of the straight ones. Use some blue or golden fireglass for even more reflexion and enjoy the very dramatic light spill. Due to the redish hue, brick, works great with any fire elements. Bricks aren’t as versatile as stones because a brick stool would be impractical on so many levels for example, but they have some additional qualities. You can build a whole patio area with a central fire pit out of the same material. They are the brass of ceramics, with some situational versatility. On their own, bricks are very subdued. But that makes them an excellent building material. And you can have multiple large elements that blend together seamlessly because they are made of the same material. You can use bricks in the construction of fire elements like the old school brick oven for pizzas or the walls of a large firepit you reuse in the woods just outside a cabin. Keep one side open and you can get a very interesting fire feature even with a less inspiring material. Pair the fire feature with a lounge seating area made of the same bricks. Alternate the shapes and angles of a short brick wall around the fire pit for some visually interesting seating arrangement. Using the same material ties everything up and opens up avenues for experimenting without making the scene to much. You can go curved, but make it an unexpected semicircle, think three 15° degree segments or two 40° segment instead of using 90° or perfect 180° semicircles. Use both 15° and 40° degree in combination, just do it boldly and intentionally, instead of small subtle size differences. Alternatively use straight walls, for fewer curves, and more space-efficient seating. To break the monotony alternate the seating spaces in height and play with it: for example start out with a low setting zone, then go very high, like bar stool high and then go down a little to an intermediate height, like that of a table. Do this for 2 walls that make an obtuse angle with one another on one side of a fire pit and you got a very unique and memorable lounge that costs next to nothing. Another cute little spin on the fire pit is a layered fire pit. Surround the fire pit with an inner wall of bricks and an outer wall, between them a layered bed of red lava rock. Trust me, the different gradients of red and arid textures will make the fire pit more lively than you think. Similarly to stone, but with a cleaner look and feel, marble is a favorite of mine, but it also comes at a cost. Additionally, you can use it as a very cool, fire pit table with a long small fiery center. For maximum effect make it a long 8 or 10 person table and let the ambient light take a back seat to the spread out the flickering fire of the centerpiece. A superb touch is if the table also comes with a granite lid for the fire pit at its center. This works also for smaller, patio coffee tables that you want to turn into evening features in a couple of seconds. That brick seating area needs something more, just add a granite top, the uneven asymmetrical pattern combined with the smooth finish just made is a work of modern art. Is the wood and brick fire pit a little boring, add a granite top or even convert it into a fireglass fire pit with a smooth thick border, on which you can put your coffee cup or wine glass on. Associate granite with cleaner shapes in a more minimalistic way and get a nice sleek modern looking garden, yard or even small urban shared yard. The look can get very clean and just a couple of rectangular and very tall terracotta planters filled with burning dark lava rock and a granite top bench can turn any sparse drab backyard into a modern expression of urban cohabitation. Basalt is an alternative, it looks very dry and matte, I like it in special situations but I would use it more like a brick because of it’s limited expression. Marble is a cleaner more elegant rock, I can’t justify the added price and limited availability. That’s why you learn design, to get interesting looks with limited material and resources. Now, we get to the good part. I love concrete and absolute versatility. Imagine any shape and texture and then google what stain you need to get that out of a drab slab of concrete. So what can you do with a toxic, mix of powder and water? Remember that modern art exposition that has some weird geometrical black statues that were just so clean and tidy that their look just stayed with you. Well being a simple geometrical shape means you can probably make that mold and you can have that ornament in your garden or home. Go further, add a bowl-shaped indent on the top of it, and leave some room for the gas installation inside it and you now have a post-modern fire feature. These bold shapes work very well with almost any setting and are a one of a kind landscaping asset. I some design ideas are wushing trough some of your minds right now, when you realized that you can create a fire feature in almost any shape, faux marble greek garden, anyone? But it goes a bit further, you can stain concrete and get remarkable textures and tones out of it. Look at the previous point on natural rocks, all that texture and richness you can get for one hundredth of the price with good concrete and some DIY. And unlike absurdly expensive natural rock slabs that could get damaged in transit you don’t have to tiptoe around concrete. Actually you can just chip it away come spring because you want a different texture. I’m not kidding, if you do it once, you’ll want to experiment over and over again. So all those shiny tops at the previous point, count them as concrete fire pit accessories with some more DYI but a lot cheaper. This opens it up to some amazing artistic opportunities if you want to experiment with it and considering it’s lower price, you can really go to town and try it out over and over again until you get just the right burgundy gloss from that textured old slab you use for a bench. Stone is very versatile and varies from natural looking too polished and very smooth and modern designs. Let’s start out with something natural and grungy. Shaded textured concrete work well with any fire elements. Even in small spaces, you can replace the log with a gas installation covered in dark lava rock and you have a dark but warm Victorian theme, especially with some forged steel elements. Add some dark moss and some long bushes to complete the look. Encircle the fire with a large marble table top and cover it with fire glass for a clean, modern and very functional fire feature that you can work with almost any themed yard. Use a linear or rectangular fire source to add some volume. Have a look at our fire pit inspirational guide for more examples here. Reverse the contrast by using more textured, darker marble surfaces for a smaller yard and add some shiny river rocks on top of the gas fire element to brighten up the small scene, literally. Fieldstone is a rugged earth rock and deserves a special mention. As a fire pit accessory use it in combination with logs and dark tones like forged steel to complete the old Victorian look. Top your brick seats with it to make the whole arrangement more natural. Build the fire pit out of it and get a primeval stove that will be unforgettable. Just over the scenes in this article. Look how many have a gravel background. But I bet you didn’t notice, did you. That’s the amazing function of gravel, it will ground those artificial elements in a scene and give the impression that’s it’s a natural scenery. Take a look at some of the less impressive fire pit accessories. I bet they are the ones where you don’t have the gravel background. You should always use gravel as a foundation for your landscaping, fire pits, lounge chairs or pizza ovens. It just displays the asset better than the ground by it’self. Have your square granite coffee table with the middle carved out and replaced by a fire feature. Have simple black lounge chairs. Be as bold and as modern as you want, and put everything on a bed of light, pale gravel. I’ve just seen this installation in the North West and even in the dreary late January light, it looked exquisite. Minimalism works extremely well in winter or where you don’t get all that much sun and bright light. Another option is to make the gravel burn. It’s the cheapest option for a common yard. Just make some fire retardant walls for a simple gravel pit and run a gas installation under it. Use brick backgrounds for something understated or fieldstone for some additional visual punch. But its flaming gravel, you won’t need to try all that hard to make it stand out among the usual blank features of an urban back yard. Combine with matte plastics, ceramics, and smooth cold concrete for a high fashion look and feel. Be bold and sparse or have small frequent sources of glimmer, your choice. This small accent needs balancing out but is such a nice natural pair with a natural source of light. The movement of the fire is essential and makes all the difference between just some shine and some dramatic movement. This also happens to be the cheapest material on this list, because unlike concrete or sheet metal you don’t need any DIY fire pit building skills or tools. Let’s be clear, you do not pair dark mahogany fireplaces with azure blue fireglass. So you still have to have a sense of it. The basic rule of thumb, pale goes with strong and use the same color tone for more flexibility and leeway between accent and counterpoint color. Use light Bahama blue glass, with dark moody finishings or take some liberties with the scene and pair that burgundy boudoir with some intense ruby red fireglass that will actually brighten up the dramatic room. Glass can also work as a countertop for very minimalist tabletop fire pits. If you have a cool, zen garden this is the ideal way you can add some depth to your design without ruining the somber mood as the glass isn’t very reflective but it’s also far from matte and absorbent. An even bolder use of glass is to use a mirror, keep it out of direct sight because it is very distracting. Keep it on an angle from the fire so that it catches it’s light and beams it back up lighting up the background and bringing it to life, almost literally as the moving hand light will cast some very strong moving shadows that create an amazing 3D effect that make the backdrop jump at the viewer, everything from simple potted plants to 3 feet hedges that aren’t all that well-kempt become a tridimensional living thriller even in evening sunlight. This is however very dependent on your angles. Most yards or patios can’t pull it off because there aren’t any blind spots to stash away the mirror. But if you do have a weird angular garden or yard, this is the best way to turn that weird abandoned extension into an asset. Different textures have a certain heaviness to them. You can only have so much weight to any given square footage before the space becomes crowded and heavy. For example, a log bench works in the great outdoors, but it will be too much fast on a suburban yard and be absurd in an inner city backyard. This is why I prefer artificial elements like concrete, plastics or brick. They are very versatile and with the same bricks you can build a mini amphitheater in large spaces and lounge around the fire like Romans or build a knee-high brick wall for sitting in the middle of an inner city herb garden. I’m talking about really tight alleys or yards where you can’t fit 2 large family cars. Get a small fire feature, maybe just a clay planter and fill it up with lava rock. Leave it to the side to just flicker some background light. Surround ¾ of it with large foliage or some other interesting shapes. By using the light around it and getting some interesting shadows cast, you get a lot of depth added to the small space. For a background, get some pea gravel, surround your fiery planter and start tracing a pathway so your design has some orientation. There should be 3 points, the entry, the sitting area and the fire and they should be obvious due to the gravel. For sitting, pick between brick, concrete log and steel seats. I like bricks because they are cheeky and add a character that isn’t out of context in an urban setting. Maximize verticality and go for high seats. The cheapest option would be DIY and with the addition of some rocks or stained concrete top, it would also be the best looking, but for a quick and easy fix, go for stainless steel chairs. As for orientation, the horizon if you have it, but a secondary choice is an entrance or lengthwise along the space to get the most amount of debt. The orientation should be obvious in most small yards, try to get foreground, mid-ground, and background in the viewers perspective. If necessary add small design elements to help them remember that there is both a foreground and mid ground. I like curved paths but they do blend the foreground and mid ground a lot and you end up with a compressed perspective. Add blocky tiles that segment perspective and get the opposite effect. This one is for people that would struggle to host a basketball game in their yard, so most people. Unless you want to spend a lot of money and detail stay within the mood and the climate. If you’re in a tropical climate use that, go from clean smooth Spanish design to romantic Arab or Polynesian. There’s a lot of diversity within one climate area design wise, forcing a temperate forest northwestern feel will almost never feel right and will cost exponentially more. Play with the dimensions, curves, and lines, move the eye from left to right with some accents, like a bright flower arrangement or a tall bright chiminea, and then lead it with gravel, stones or some large foliage across the horizon. Boxes are boxes, if you’ve seen one square yard, you’ve seen them all, but each trip the eye makes is an experience, as simple as that may be but it’s always more than just a rectangular space. Ideally, you want to have a primary fire and a mood gas fire in the background or relegated to the sides. Have a central sitting area. Go as wild as you want it to be, just keep it in theme and proportions. Patio furniture is again the go to a quick fix, but please consider brick especially if you have a larger yard. Please do use curved lines punctuated by flower beds and extend the gathering area to take in as much of the yard as you need. As you’ve seen we can do a lot with limited space by playing with perspective, but we can’t compress people. So add a lounge area, a fire pit, a dining area and a grilling area in a interesting stretched out way, as long as you integrate the features into the environment it won’t take anything away and it will add so much life to your garden when you have a party, that you won’t believe. ….Large properties, edge of the woods, or a whole forest for a backyard. First of all, abuse gravel pathways and spread out the points of interest. You have space, no reason why your grill should be feet away from your seating area that is in splashing distance from your water feature.Please use the environment. That’s the perfect background for landscaping. Don’t hide it. Create a transitional area that is very man-made and artificial, maybe even modern if you wish, then create mid-ground elements that blend man-made foreground and the wild background. Concrete, steps, walls and art features if you want to have a modern foreground like a polished steel propane gas grill. The important thing is that the view will always end with nature, so whatever you want to make out of your foreground you need a mid ground to ease the transition. If you keep this in mind you can have as modern of a patio as you want and it will integrate seamless into your environment. The people have spoken and we have catered to their requests for a clear container that is perfect for filling small to moderately sized fire pits. Exotic Pebbles is proud to Introduce the new “clear-view” and “easy to carry” 12 Pound Fire Glass Pail of our industry leading Classic Fire Glass and Reflective Fire Glass to reform and modernize the homeowner fire feature experience! The clear presentation of the new 12 Pound Fire Glass Pail allows our homeowner clients the ability to clearly see the different colors and textures of our Fire Glass to select the appropriate one to fit their design needs. As people, we need to clearly see something in its actual state to full make a decision. We would hate for our customers to get back to their residence after prepping their fire pit or fireplace, and not like the choice they have made. This eliminates all doubts and concerns about the size and color of the fire glass, which I know our customers will appreciate. The 12lb. pail also features a comfortable sturdy handle providing consumer confidence when the pail is selected and handled for purchase. The packaging in itself is “added value” as a multi-purpose container for the homeowner because, we all need a bucket sometime around the house. The new clear packaging isn’t just a new container size, but a new program which features our largest and most distinctive sizes and colors of our industry leading Fire Glass. The program includes 16 of our very best selling items including: 8 of our prominent ½” sized Reflective Fire Glass and 7 of our ½” – ¾” sized Classic Fire Glass. 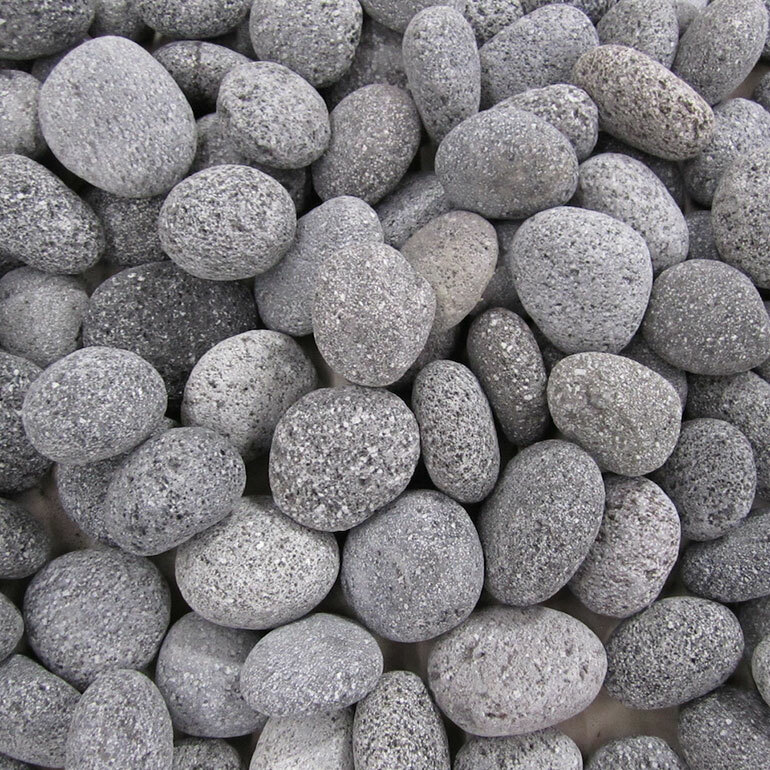 The Classic program also includes our contemporary and unique Black Lava Fire Pebbles. Here are a few of our top selling colors for example: Copper, Cobalt, Black, Sky Blue, Bronze, Gold, Silver, Teal, Amber, Bahama Blend, Turquoise, Ocean Blue, and Chestnut. We have the correct color and texture to meet any interior or exterior fire feature design application of today. You can see our new 12 Pound Fire Glass Pail Program as a Fire Glass option on the website here. Make sure to utilize our coverage calculator to to easily determine how much Fire Glass you will need for you specific project. Also make sure to stop by our Gallery and take a look at a few images to draw some inspiration on how you would like to design your fire pit or fireplace, and what color or style of fire glass you would like to use. The Holiday Season is one of our favorite times of the year to sit around an open flame of Reflective Fire Glass and the ones we love. Even though everyone has a ridiculous amount of tasks to complete in the last 50 days of the year, people are still filled with kindness. With Thanksgiving approaching in a few days, people are preparing their houses to showroom quality before their family and friends come by spend some quality time. Now that the temperature has finally dropped enough to turn on the fire pits and fireplaces, you can finally switch out those old lava rocks or fake logs with Exotic Fire Glass and give your house a great little upgrade that is sure to impress your guests! In this post, we will share with you many great benefits to using fireglass over lava rocks or fake logs, how it is made, how to properly install and use your glass, and we will give our recommendations on how to beautify your home for the holiday season. So what is the big differences between Fire Glass vs. Gas Logs and Lava Rocks? We are asked this question all the time and we love to answer it! First off, Fire Glass looks amazing inside fire pits and fireplaces. The way that the flames burn through the small spaces between glass looks much more elegant and luxurious than outdated ceramic logs and lava rocks. 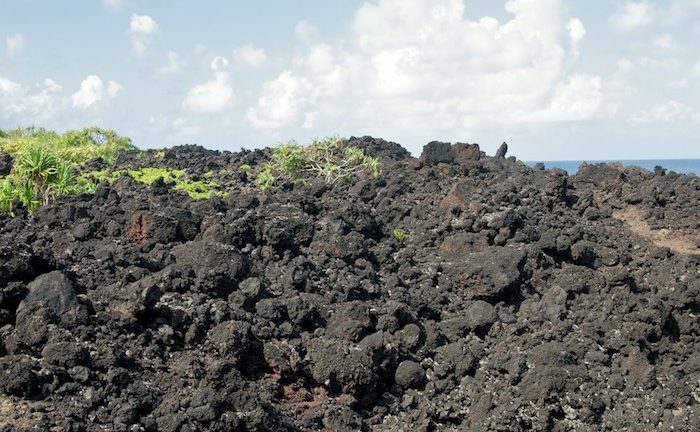 Second, lava rocks have a tendency to be extremely messy. After an open flame had been burning them for a while, they begin to fracture and turn into a dust that is near impossible to get off of your fire pit walls or patios. Ceramic Logs are no different,. Not only do they look strange because they are fake, but they blacken very quickly and have to be replaced . Second, Fire Glass produces more heat than gas logs and lava rocks because of a few factors. All of our fire glass reflects heat much better than logs or lava because of the smooth surfaces and shine, however our Reflective Fire Glass works the best at reflecting the fire to the surrounding areas, thus it produces more heat. If you are looking to make your fire extremely hot, we recommend setting your fire glass in a metal burning pan which will radiate 2-3 times more heat. 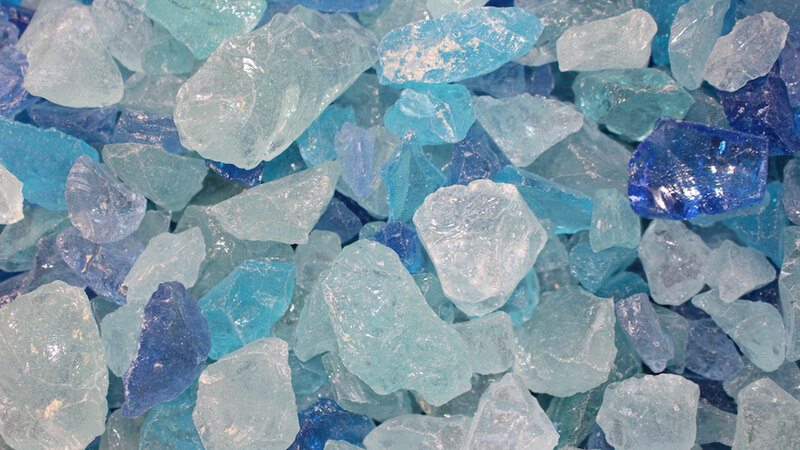 We got our start in the fire glass industry by manufacturing our own fire glass from 100% consumer recycled glass in our state of the art facility in Phoenix, AZ. This allowed us to perfect of color recipes as we moved abroad to work with some of the finest manufacturers in the world. The process starts off by melting down various types of recycled glass from old bottles and windows using specially designed furnaces that reprocess and heat the glass to 2880 degrees Farenheit. At this temperature, the glass is molten and burns away any previously added materials to give it a distinct color or composition. From here, we add in our secret recipes of various metals and elements that give glass it’s desired color. Each color requires a distinct cooling recipe because of their different compositions. Once the cooking and cooling process is complete, the glass is crushed, sized and washed to remove most of the sharp edges. 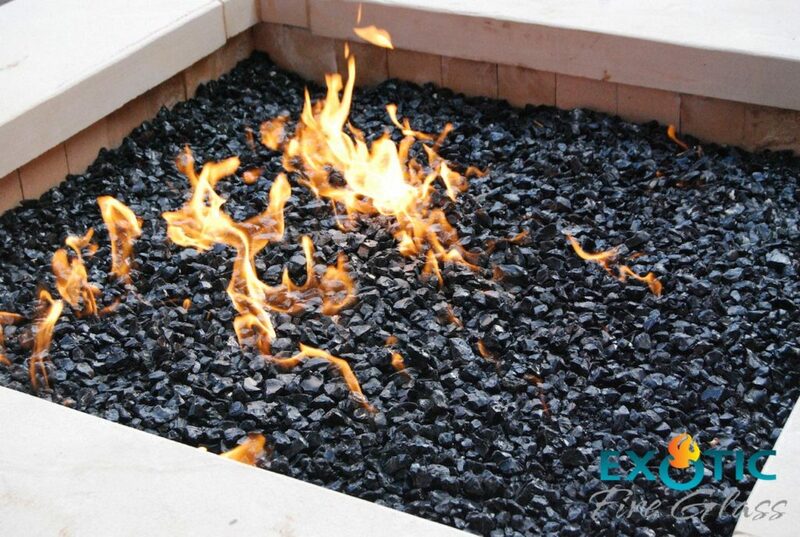 To install fireglass in an already existing fire pit or fireplace can be done by anyone that is able to lift the specific sized bag or bucket that was ordered. The most challenging part is determining how much glass you will need for your specific fire pit or fireplace. We have ended all confusion by creating the Fire Glass Coverage Calculator. Start by determining whether your fire pit is circular or square/rectangle (box). The Coverage Calculator will ask for either the diameter or width x depth of your fire pit location, followed by how many inches deep you would like your glass to be. We highly recommend choosing the two inch choice to make sure the steel burner where your gas is emitted is completely hidden from view. The Coverage Calculator will tell you right away how much glass you will need in pounds (lbs. ), which will allow you to choose the correct sized bag or pale for the job. Next, clean out your old fire application lava rocks or ceramic logs and sweep thoroughly. While wearing a pair of workers gloves so you do not cut yourself, Pour the rocks in carefully and distribute the fireglass evenly until your steel fire ring or gas emitter is covered. Remember that not all fire pits/fireplaces are the same. Some require areas to be free from coverage to allow for proper ventilation or air intake. Please remember to read the fire pit/fireplace manual before installing. Every Fire Pit or Fireplace has its own set of rules and regulations on how to use. For the most part, having fireglass instead of lava rocks or fake fire logs should not change the way you operate it. We do however have some recommendations on how to operate your fire to help ensure the life of your fireglass. Exotic Fireglass will never melt, emit toxic fumes or become discolored if used correctly in fire applications less than 1500 degrees Farenheit. We recommend that if you have a choice between natural gas and propane, that you choose natural gas because it burns cleaner than propane. Propane can cause some discoloration on some of the lighter colored glass and can also cause some slight discoloration/residue in the reflective fire glass collections due to it producing more carbon. Propane is also heavier than natural gas, which causes it to sink below the burner surface rather than mixing with the air above the burner. A buildup of propane may cause flare-ups or combustion under the surface, which may result in the glass (mostly the reflective fire glass) cracking and popping. To fix this problem, we suggest using an LP converter, which is an air mixer if you use propane, which will allow air to mix with the propane prior to burning. This will lighten the heavy propane and remain above the surface rather than sinking. We also recommend using a pan burner system when building your propane fire pit to prevent the propane from sinking beneath the surface. This will also create more heat for your fire application to keep you warm and toasty. So now your are familiar with the benefits of fire glass, our manufacturing process, and how to correctly install and operate your fire glass application, we have some great recommendations for you during the holidays. One of our top sellers this year and since 2014 has been our Reflective Fire Glass. Unlike our recycled glass, or reflective fire glass is sourced from broken tempered glass panels that we create a mirror finish on one side, creating a brilliant, yet elegant look. The goal is to pick colors that you will be happy with year around depending upon your interior decor or landscape style. The following are a few images of our client’s houses that we thought did a great job of styling their fires for the holidays! If you have lots of wood features, flagstone, or stone landscaping; you’ll want to match a darker colored fire glass to your yard. View a full range of fire glass colors and sizes here. If you are worried about overmatching, the shine from the reflective surface will give it that little edge to break it up. Copper also goes great with backyards filled with green foliage. 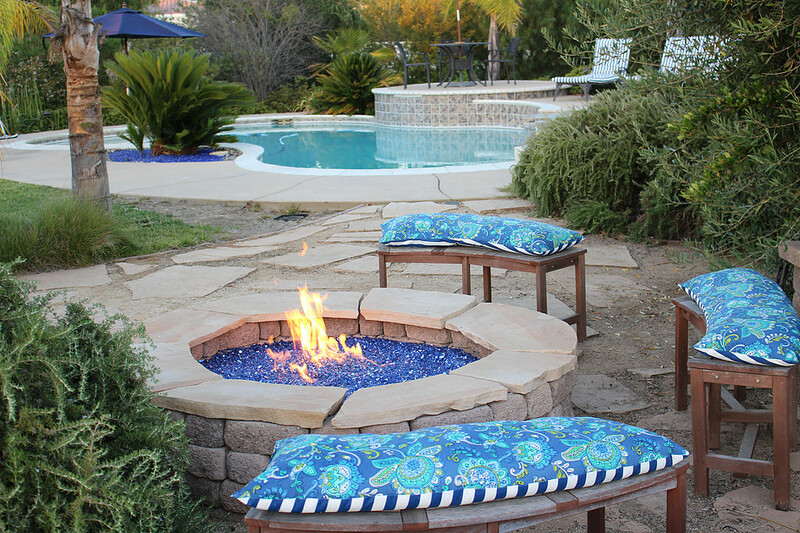 If you have a fire pit by a pool, then we recommend adding the Cobalt Blue Reflective to match it. 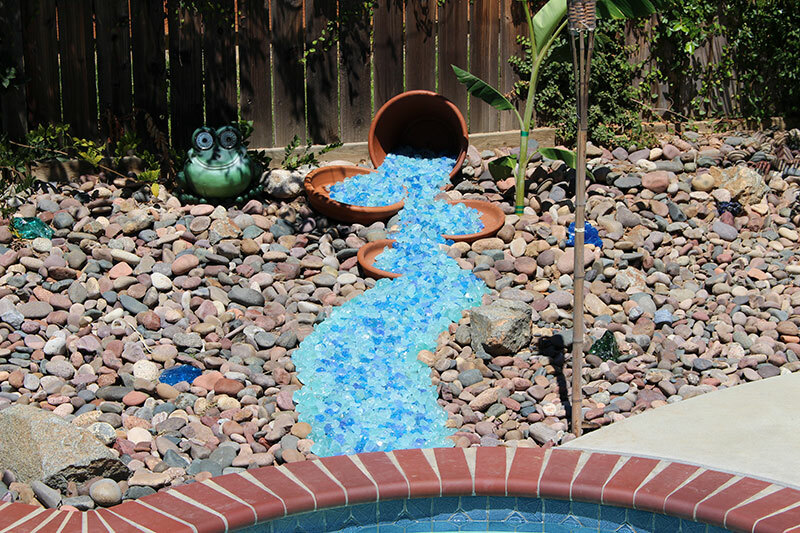 Be aware that blue is a very powerful color so if you already have a lot of blue in your yard, the color might create the illusion that your entire backyard is blue. In the above picture, these clients have just the right amount of blue features with the Exotic Landscape Glass in the planters, their bench cushions, and their umbrella that give it just the right amount of swag. Remember, right after Thanksgiving is Christmas! Here our client did a combination of Crystal Reflective and Black Reflective Fire Glass to highlight the colors that are in the stone surrounding the fireplace. We love how they decided to separate the flamed area and surrounding areas because if they were mixed together, it would look much too busy. like wearing a striped tie, with a striped shirt and a striped suit… you just don’t do it. Thank you for stopping by to learn about our company and how you should style your house for the holiday season. If you have any questions regarding Reflective Fire Glass or Recycled Glass, don’t hesitate to contact us at (760)444-4190. Happy Holidays!